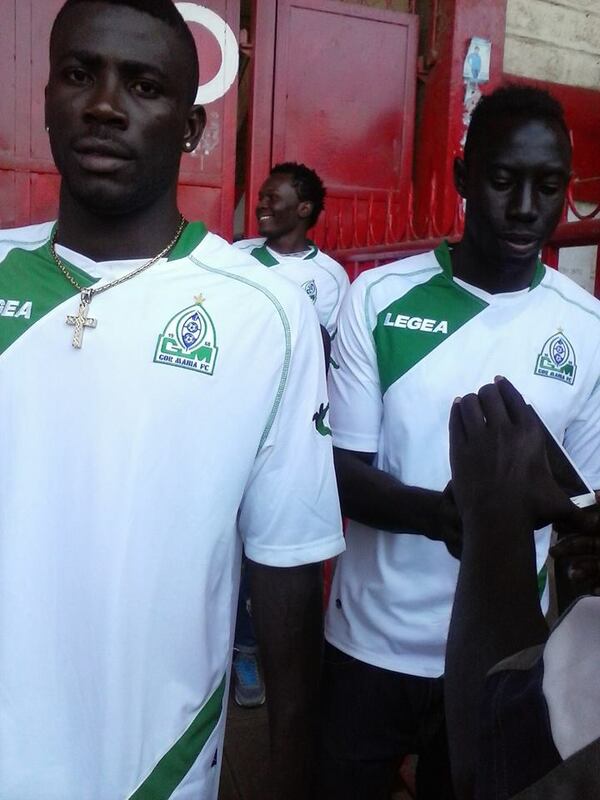 Gor Mahia’s new signings are speaking out on what should be expected from then in the coming 2015 season. “I don’t want fans to compare me with Owino, I’m joining the team to assist them win titles. I know it’s a challenge because they expect me to prove myself since they lost Owino. “They expect me to do more than him but I assure fans I will do my best in partnership with my colleagues to succeed this season,” Glay told Capital Sport. Glay who signed a two year contract went on to say that he was motivated at the prospect of playing for Gor Mahia. Jerry Santos, a defensive midfielder is also motivated at the prospect of playing for Kogalo. “It’s been a challenge playing outside my country but I have gained experience I want to use in my future career. K’Ogalo is a big team and it’s an honour joining Kogalo. Santos also said he is his own person and rejects comparisons with the departing Kizito. Santos, who is 26, was first discovered in 2008 while playing for Dandora Youth in the Extreme Super 8 tournament. He was soon recruited by Tusker. His career also took him to Vietnam, Tanzania and Albania. In 2012, he won a case against Albanian side KF Tirana after they terminated his contract prematurely. He was awarded US $35,000. One thing the 20 year old Ghanaian does not lack is confidence. He says he scored 18 goals while playing for Al Shaab in the United Arab emirates and he has put Kenyan defenders on notice that he plans to replicate that form in Kenya. Prince Tagoe who played for Ghana at the 2006 world cup is also a former Al Shaab player. Zachary revealed how former Gor Mahia player Dan Makori enabled him to land at Gor Mahia. Zachary hopes that his exploits will enable him to someday play for the Ghanaian national team. well said….now do your talking on the pitch and all the best!! It appears Gor Mahia are “going to get a second bite at the cherry” therefore we ,especially Jakom AR and the bloated EC must not let the opportunity slip this time. Fans/ members must also not let up on pushing the EC towards positive solid reforms. By this I mean we should use the sponsorship period (remember Biblos’s JOSEPH’S 7 YEARS Of PLENTY) to plan any period when we may not have sponsorship. Now is the time to revamp the club’s membership structure(I still stick my head out that Sacco is the best) by offering at least discounted home match tickets and privileged seating areas (among other benefits already well articled here) in exchange for members paying membership fee of between 250-500/month quarterly in advance. I.e a second chance to put GMFC on a sound financial footing to be a powerhouse in CECAFA/CAF. During the sponsorship period the EC should put in place structures that ensure that club revenue (be it from membership, gate collections & merchandizing etc) are streamlined and all possible loopholes sealed. We can even invest in CCTV equipment to be hired out in other matches/events when GM is not playing generating income for the Sacco/club. Yes Leonard you are so right in some of our hearts its Gor Kende! Now that the EC have done their bit can we do ours by getting the team voted the STOY by dialing #279#. I do concur with @Oduor12 posting. We need to all think positively and get the EC implement some of the bloggers’ postings. We all mean well for Gor Mahia as our ultimate objective is to continue winning all trophies and at the same time entertain our fans. This time I think Ec shud introduce seasonal tickets for all home matches bcos I blive atleast 1000 kogalo faithfulls will not hesitate to buy. Kudos to EC for making quality signings. Now it is upon players to show what they r by qualifying for group stages of champs league. Our biggest challenge is and has always been hooliganism n people buying tickets at half price. With security secured u will see more fans and more revenue for the club. That alone is a serious step towards financial stability. CATCH AND PROSECUTE HOOLIGANS and the issue will be sorted by a big deal. ayie go, how about Keli from afc, any progress? The incoming players are in the right attitude. Letting us know that they are human beings who have flaws.The motivation is they are willing and committing to do their best. Let us give them the right support that is also motivational. Truly the EC has done a commendable recruitment and i do not see a better one in the recent years. Let the fans now do our part in cheering and encouraging the boys to a third straight league win. This is one of the best things to happen recently. Let us round on KELI now. By the way how many strikers do we have in the team, i fear ‘wapishi wengi’. In short i will not be disappointed if we don’t land more players if anything over ten acquisitions in a team is already too much. I think some of these strikers are just experiments. Nobody knows how good James Ohawa is. For that matter how good is Taofiq ? We shall find out soon. Gor Mahia’s move to acquire Ghanian striker Zakari Taofiq complicated the club’s chances of also securing the services of another West African forward Traore Koh. It is widely believed that a section of Gor Mahia officials and Koh’s representatives agreed on a year-long renewable deal early this month with only a few details – including financial guarantees – standing in the way of the player to put pen to paper. The deal is estimated to be worth $35,000 (Sh 3.17 million) in sign on fees and a monthly salary of about Sh 180,000 a month. Instead, and in what is seen as competing interests between the club’s administration, the club has instead opted to secure the services of the Ghanian forward whom “nobody has ever watched play”. “That Ghanaian was signed with express blessings and authority of the club’s hierarchy, nobody could dare say no. We just hope this is not another case similar to that of (Brazilian midfielder) Giovanni Rodriguez,” a club official told a top local radio station. I have been in the training ground at city stadium for the last four days and what i can confirm for you is that these so called new signings who are talking a lot ,i dont see them taking us somewhere a part from the new signings whom we have seen playing in our local league.THERE IS ONLY a defender we signed from talanta called waruinge and wendo. the new signings are not ripe for gor mahia. where is this man INGO?